Congratulations to 2014-15 Humphrey International Fellow Gladys Hlatywayo of Zimbabwe who was awarded the prestigious Chevening Scholarship! She will study public management and governance at the London School of Economics. 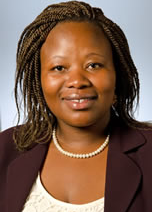 Gladys Kudzaishe Hlatywayo is a civil society activist and leader from Zimbabwe and is Director of ZIMCET in Harare. She has more than ten years’ experience in Zimbabwean civil society and began her activism as a student leader at University of Zimbabwe before joining Crisis in Zimbabwe Coalition, a local coalition advocating for a democratic Zimbabwe. She has also worked for Casals and Associates, a USAID contracted grant making company that was working with civil society in efforts to further the democratization process in Zimbabwe. Currently, she is the Executive Director of Zimbabwe Civic Education Trust, an organization that focuses on education for rights, peace and development.